*** NOTE: There will be an OPTIONAL pre-seminar WORKSHOP on Friday, June 9, from 2-5:30 pm (3 contact hours) for an additional $99*, with Andrea Brennan, OTD, OTR/L, CLT-LANA, WCC, CI-CS: "Bandaging the Tricky Places: Head & Neck, Breast and Groin"
Call for Reservations and ask for the discounted Lymph Seminar rate of only $159/night! 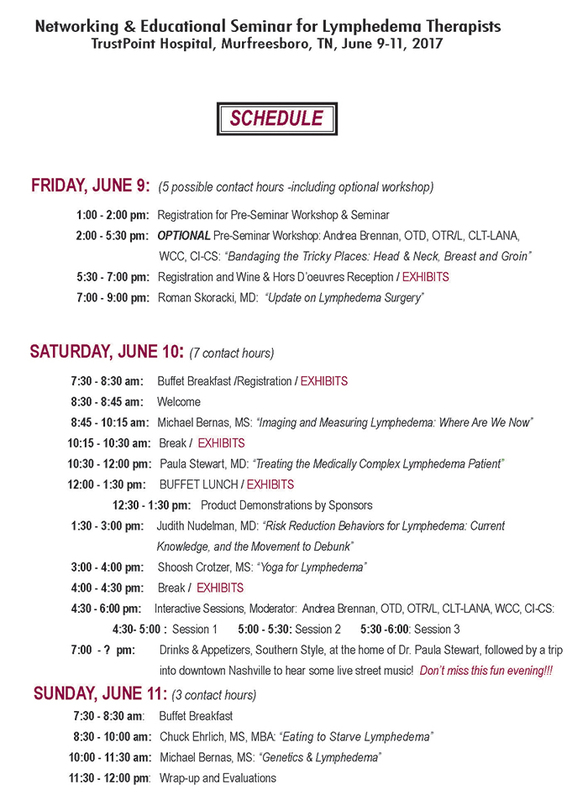 Roman Skoracki, MD: "Update on Lymphedema Surgery"
Michael Bernas, MS: "Imaging & Measuring Lymphedema: Where Are We Now" and "Genetics & Lymphedema"
Paula Stewart, MD: "Treating the Medically Complex Lymphedema Patient"
Judith Nudelman, MD: "Risk Reduction Behaviors for Lymphedema: Current Knowledge, and the Movement to Debunk"
Chuck Ehrlich, MS, MBA: "Eating to Starve Lymphedema"
Lymphedema Seminars is an Approved Provider #8208 for Continuing Education by the American Occupational Therapy Association (AOTA). We are applying for CEUs for PTs in Tennessee and will provide Certificates of Completion. Check back for final approval news!